For those who may have missed it, a useful slide was tweeted out yesterday by Michel Barnier's adviser, Stefaan De Rynck. As we see above, it depicts the nature of the EU's regime on external controls imposed upon third countries. The red text was not added by me but is in fact very interesting. It highlights the extent to which a customs union relates to border friction, and by comparison the use the Single Market (EEA) has in diverting controls away from external borders. This will be of particular significance to the Irish conundrum. 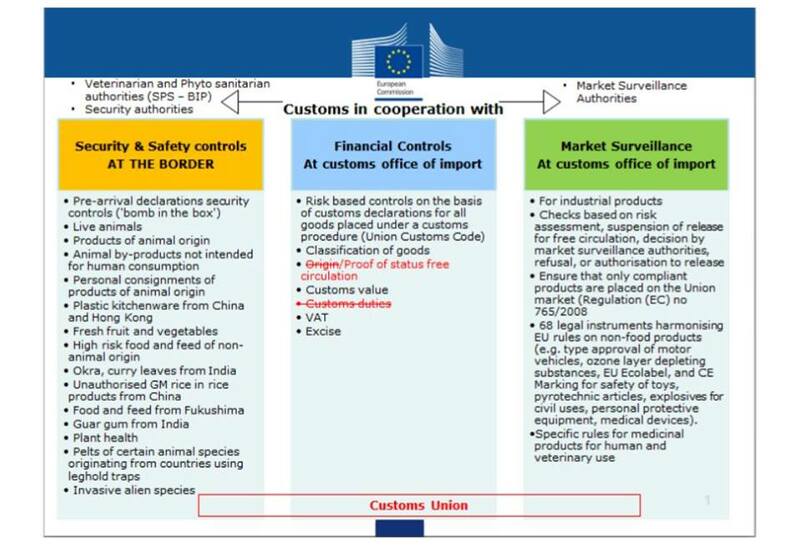 In essence this slide tells us that when in a customs union with the EU, checks for proof of origin and payment of tariffs are not necessary. There is a very simple reason for this. By virtue of the fact that members of a customs union have a Common External Tariff (CET) wrapped around them, it can be assumed that a good inside that customs union either originates in the EU, in which case it automatically qualifies for preferential treatment, or it has filtered through the CET in order to move on to a member state, and so also qualifies. Checks for origin therefore move to the external borders. In reality these two checks are pretty minor, but they become important precisely because in order to carry them out, a modest amount of infrastructure is required. Typically this amounts to customs posts, a lorry park and officers instructed to scan barcodes on documentation for feeding into highly integrated computer systems. The technological aspect of customs procedures is likely where the British government will struggle most, and I think this element of the Irish border issue is increasingly under appreciated. Violence is not the only potential problem to worry about. In the event of the absence of a customs union between the UK and EU, exporters will likely need to provide some form of origin declaration at a border facility and where necessary proof of tariff payment. Some hauliers will also be asked to provide an invoice when transporting goods on behalf of another company. The issue with these stoppages is that they build up and create time-consuming queues. It is unclear how long customs queues will be and what material impact they will have upon, especially, just-in-time supply chains. Disruption may mean some supply chains are lost altogether. Customs checks imposed upon British exporters in the event of an absence of a customs union will be pretty painful, but they are merely a drop in the ocean when we compare the impact with the impact of leaving the Single Market. It is here, denoted by the black ink in the graphic above, where much of the enforcement regime - where the checks come in - will be fundamentally altered. As I have been at pains to point out at this blog, one of the primary benefits of the Single Market is that it positions checks on product standards at the point of production, before goods reach importing member states. This point is absolutely central to understanding the effects of leaving the EEA on the EU's enforcement regime and on our borders and supply chains more widely. The Single Market plays host to an intricate web of regulatory agencies that are responsible for cross-communication in the event of potential criminal activity and maintaining information on the completion of checks and the manner in which checks out to be carried out. 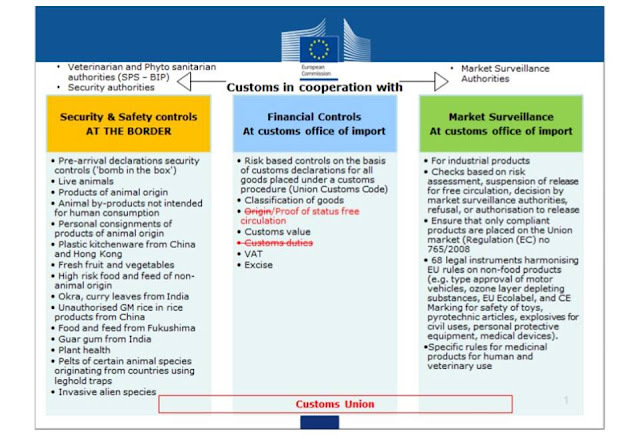 This web is called the EU's market surveillance programme, the primary mechanism held responsible for keeping our borders frictionless. The text in black ink above outlines the breadth of influence possessed by the Single Market, and just how important it is to us. It is one of the main reasons why I don't support leaving the EEA. To be a part of the Single Market means to be a part of its enforcement regime. Leaving those regulatory agencies (which comes with de-alignment) means the relevant checks are re-positioned to the point of the border. This is just how trade works. This concept stands as the primary structural difference between a Free Trade Agreement and the Single Market. It is a little ironic that just hours after we see this slide emerge, a van driver speaks to James O'Brien on LBC and outlines the difficulties he faces outside the Customs Union. He spoke passionately and articulately and I sympathise with his situation. This is why I despise the constant lying from figures like Dan Hannan and Kate Hoey, who serve only to maximise their own partisan audience share. The point I seek to make, though, is that the bigger picture paints the Single Market as a far more important instrument in the border cleaning process. I think a re-focus is in order. Wasn't the LBC caller wrong to cite the customs union as opposed to the single market? Possibly, possibly not. The man wasn't questioned on this annoyingly. He didn't elaborate on what he would show at customs.